Voices are hushed and old men grow stern and thoughtful when the Great Tea Trolley Disaster of ‘67 is mentioned. The facts are shrouded in the mists of time. It is not clear who was involved or what happened. What is certain that the first mention of the disaster was in 1972. 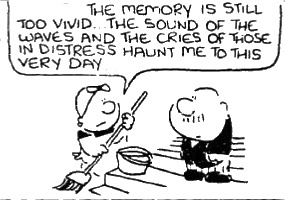 Was its terrible memory suppressed until then? Was there a massive cover-up that would make Watergate (which also broke in that year) look no more sinister than a buying clerk drawing an extra pair of paper clips to use as cuff-links? The disaster was such a shock that everyone has a different view about what happened, or indeed when it happened. Sometimes it is placed in '68. Some maintain it occurred in accounts, others that it was in the factory. Some say the tea-lady concerned seems to have been a Mrs. Mylett but whether she was moving her trolley in or out of the room is a matter of argument strip 3396 . So far-reaching was the Disaster that every one in the building was shifted around afterwards. Lines at waist height on some corridors indicate the depth of the inundation. The name of Errol Chester-Perry (ne’er do well second son of the firm’s founder) is linked in some way, though nobody seems terribly clear how, just that his sudden departure to South America was too much of a coincidence. Bristow, who starts off not knowing much about the Disaster, must have had a similar memory loss to other survivors due to the trauma, because he discovers one day the yellowing pages of an early draft of Living Death. Some of the pages are stuck together and he can just make out the words "Today there was a terrible disaster with the tea trolley..". His memory has returned in 1990 when, taxed by the postboy for his part in the tragedy, he relates "I knew nothing about it until the cry went up 'Women and children first!'" . For more about the postboy and his inquiries, see strip 8241 noted below. The little lad returns in 1991 to ask further and is told "Not much to tell...it all happened so fast...One minute we're sipping a cup of tea... next minute we're up to our eyes in it". In 1995 Bristow claims that thanks to the Disaster the number of potential rivals for Chief Buyer was reduced "We lost Wickerson and Bothwick in the Great Tea Trolley Disaster and Diffey was put away after the Luncheon Voucher Swindle". And a few months later he claims that he was lucky "I had almost given up hope when a hatstand came floating past". The story of the Great Trolley Disaster takes a much more sinister turn when Mrs. Purdy introduces a temporary tea lady, one Maureen Trelawney. She hides a tragic and eerie secret. But what do we know about Miss Trelawney's mother? Mr. Pringle, of Ponsonby's Permanent Positions (the man credited with placing Bristow at Chester-Perry's) has the answer. 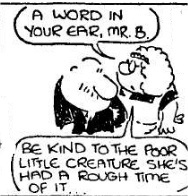 Strip 4032 was published in the Evening Standard in February 1974 and in Bristow Extra. This scan is from the Melbourne Age March 1974. Strip 3449 was published in the Evening Standard in April 1922. This scan is from the Sydney Morning Herald May 1972. But that is not the end of the matter. The controversy about culpability never ends. In 1993 Bristow pins the blame firmly onto Mrs. Purdy (who has apparently retired in 1992). Then we are told it was all down to Mrs. Purdy's mother. 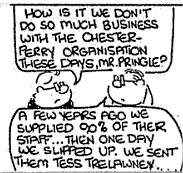 In a strip on frankdickens.com in June 2009 the clerks are divided as to whether the culprit is Purdy or Mrs Chrisp. (The date of the disaster has now shifted to 2002) Bristow has a theory that it all started as a simple assassination plot directed at Sir Reginald Chester-Perry. This seems a little far-fetched. Plenty of clerks may have taken ill as a result of overindulgence in the delights of the tea-trolley but none appear to have died. Mr London, the oldest member of the Chester-Perry Drama Group, is strongly against reviving "Noah and the Great Flood" for the seasonal play in 1975 - "It was ruined by the GTTD". Braithwaite of Development, a man known to hate the Chester-Perry organisation as much as Bristow does, is also known to have laughed only once - during the Disaster. David Elliot is awarded the Chester-Perry medal for his heroism in 1983. Bristow starts celebrating David Elliot Day, on 31st May each year, a day on which no work is to be done (just like any other day really). Bristow usually has an "old adage" to declaim and if you can bear it, there are some examples with his other poetry. Roy Hodgson, toasted in tea in 1985, is the man who blocked up the keyhole of the canteen door (the clerical equivalent of the Dutch boy with his finger in the dyke). Harvey ("the clerk with the doleful countenance", wrote the definitive Chester-Perry story but saw his life's work washed away with the Great Tea Trolley Disaster. When he relives the experience in the Sick Bay, awaiting his daily tranquiliser, he begins "It was 10:35 on a cold grey November morn..."
Strip 7204 was published in the Evening Standard in July 1986. This scan is from the Glasgow Evening Times July 1986. Strip 7205 was published in the Evening Standard in July 1986. This extract is from the Sydney Morning Herald October 1986. While talking to the "firm's oldest inhabitant" in 1987, Bristow asks if it is true that a certain buying clerk distinguished himself during the Disaster by shepherding dozens of helpless colleagues to safety. "It is true" says the FOI "I was that buying clerk". Now this particular story gives us two difficulties - the title of firm's oldest inhabitant was held by Mr. Methusaleh who was not a buying clerk, but even if he was, then he would be one of Bristow's colleagues which he was not. The only other conclusion is that the GTTD is now assigned to a legendary time before Bristow joined C-Ps. Or maybe there were two of them. The jury is out (and likely to be out for a damn long time) . The "legendary" Rigby is spotted roaming the corridors in 1988. He "came through" the Great Tea Trolley Disaster. "Must have been a helluva swimmer" Bristow comments. A similar case is one Tom Woods who, in a 1994 strip, wanders the corridors muttering "the tea leaves...the milk...the sugar lumps". Yellowbelly Clerkson, a legendary Chief Buyer who never came out of his office was, apparently, swept away by the '87 version of the GTTD (according to R. Bristow). Strip 6956 was published in the Evening Standard in July 1985. This scan is from the Glasgow Evening Times July 1985. The swindle originated in the East Wing, according to the caretaker. In 2010 Bristow names one Freddie Loftin as the brains behind it. Also linked to Errol Chester-Perry, according to the gossip columnist of the Morning Rag . Bristow alludes to this once or twice, and the caretaker places it as occurring in the East Wing, but no further details have been forthcoming. Strip 8241 was published in the Evening Standard in August 1990. This scan is from the Sydney Morning Herald August 1990. All mentioned, tantalisingly in 2009, while the firm's Roll of Honour is being reviewed. Organised by "Chuckles" Holland who is still doing time for it, if you believe anything Bristow says.